Enterprises migrating from the legacy on-premise communication platforms to Unified Communications and Hosted PBX solutions is an expanding reality. Although VoIP technology has ensured a huge set of new services and has become more popular over the years, doing a complete SIP migration can still be unaffordable for some companies, especially if an important investment was made for the legacy telephony equipment in the past. Media5 offers a wide variety of products’ families to suit both the service providers and the corporate networks. Our solutions are available as hardware appliances and as software suitable for virtual environments allowing more efficiency and productivity, while supporting the flexibility to adapt to specific needs of operators and enterprises at any time. Scalable range of devices with support for analog telephony interfaces into SIP based networks. Multi platforms to connect PSTN lines and legacy PBX systems to Voice over IP (VoIP) networks. Enabling seamless, reliable, and secure connectivity with SIP trunking networks. With the fast evolution to IP networks, Service Providers are offering cost-effective Hosted PBX services to their Enterprise customers. Such a service allows the enterprise to benefit from the powerful feature set available in a Hosted PBX offering without having to invest in new on-premise systems, with the additional costs of administration and maintenance. However, when migrating to a Hosted PBX solution, Enterprises often need to continue using their existing analog devices (phones, faxes, and modems) and benefit from investments made in these devices while integrating new IP-based devices, such as computers, cell phones, and smart TVs). Mediatrix 4102 VoIP Adaptor provide a solution to connect analog phones, faxes, and modems to IP Communication Systems. In traditional networks, PBX access to Service Providers’ Networks is typically provided with TDM Trunks from the carriers to the customer premises. As Service Providers are constantly evolving to IP Networks, these costly TDM Trunks can now be replaced with SIP Trunks that provide more competitive pricing, bringing significant savings to end users. 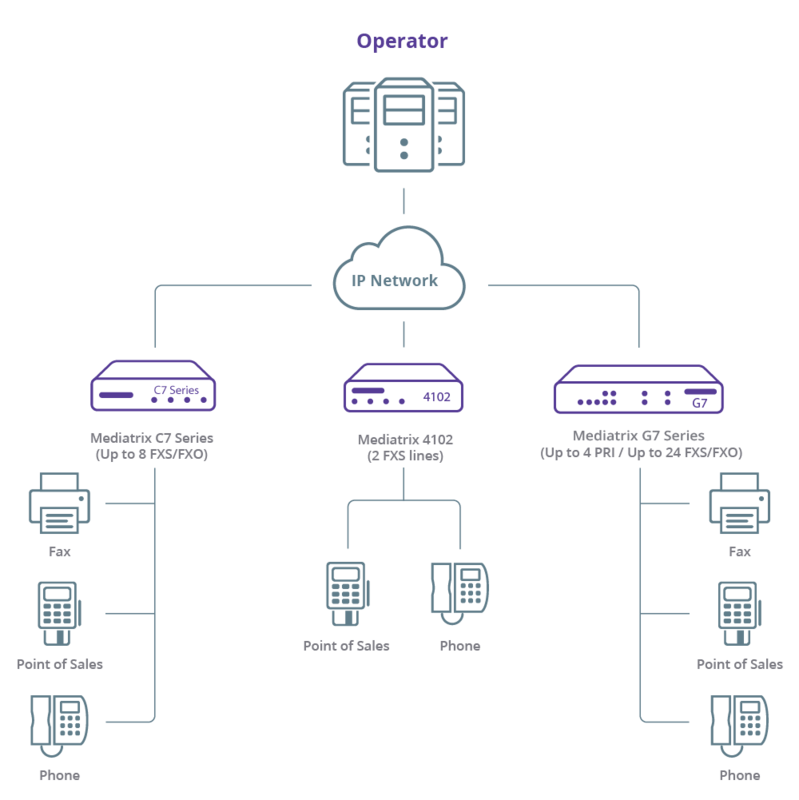 Using SIP trunks to connect these legacy PBXs require the use of VoIP gateways to provide the conversion from SIP to TDM. Such an application further allows the enterprise to begin the process of conversion to IP telephony without having to replace the PBX system, thus protecting investments made on PBXs as well as analog phones, faxes, modems, etc. ITSP can now supply SIP trunks and cost-effective virtual PBX service with robust and redundant Media5 platforms. This way, corporate clients benefit from all the advantages of an IP-PBX without the need to install, maintain, or manage the PBX system. Mediatrix G7 Series is a reliable and secure VoIP Analog Adaptor and Media Gateway platform for SMBs. Featuring PRI, FXS, and FXO interfaces; the Mediatrix G7 Series provides the best solution to connect legacy equipment to cloud telephony services and IP PBX systems to PSTN landlines. Enterprises are more and more looking for cost-effective transitions to all IP communications to harness the possible savings by combining voice and data communications. Many will select a centralized IP-PBX system rather than a hosted service to provide head office control of the system and the network. However, when these companies have multiple sites as well as remote employees, a good way to promote equivalent functionality to all sites, without having the cost and administration required when deploying a server at each site, is to count on Media5’s portfolio. We provide the full telephony features of the centralized server, a guaranty for security and critical survivability in the case of a network (WAN) failure, to ensure that the branch (remote) office is not isolated and can maintain both local telephony as well as access to the PSTN. How can we do this? 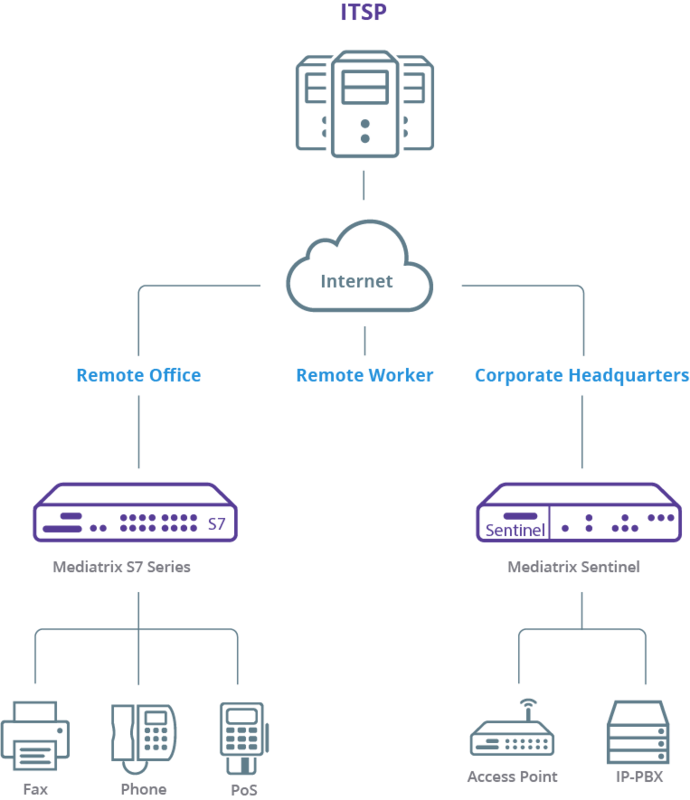 Just as the firewall provides security to the data network, Mediatrix Sentinel provides security to enterprises’ VoIP networks and users’ calls. Sentinel is a multi-service business platform bundling Session Border Controller (SBC), Media Gateway and router capabilities into a robust, field-upgradable platform. It protects both enterprises’ and service providers’ networks against fraud attacks and other vulnerabilities building a confidentiality shield for signaling and voice traffic. Mediatrix Sentinel units are multi-function devices combining VoIP IAD, Gateway, transparent proxy and SIP-aware Router/NAT/Firewall. It offers a powerful platform designed with top security and survivability for hosted applications in multi-sites, branch office environments, and connected off-site users.